Scientists say they have developed a tiny blood-testing device that sits under the skin and gives instant results via a mobile phone. 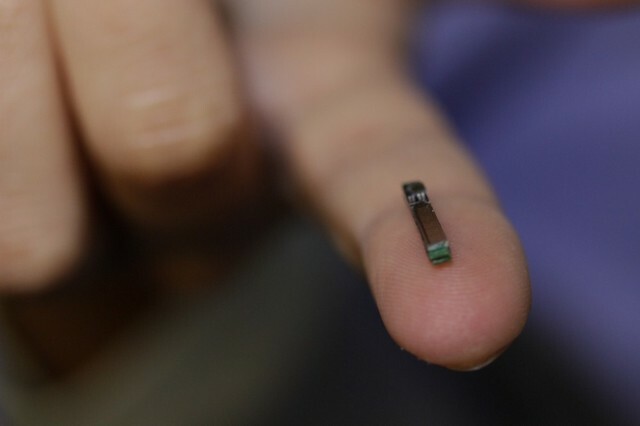 The Swiss team say the wireless prototype - half an inch (14mm) long - can simultaneously check for up to five different substances in the blood. The data is sent to the doctor using radiowaves and Bluetooth technology. The device's developers hope it will be available to patients within four years. It is designed to be inserted, using a needle, into the interstitial tissue just beneath the skin of the abdomen, legs or arms. And it could remain there for months before needing to be replaced or removed. Other researchers have been working on similar implantable monitoring devices, but Prof Giovanni de Micheli and lead scientist Sandro Carrara say their under-the-skin test is unique because it can measure many different markers at the same time. They say it will be particularly useful for monitoring chronic conditions such as high cholesterol and diabetes as well as tracking the impact of drug treatments such as chemotherapy. Prof De Micheli, of Ecole Polytechnique Federale de Lausanne, said: "It will allow direct and continuous monitoring based on a patient's individual tolerance, and not on age and weight charts or weekly blood tests." So far, the researchers have tested their device in the lab and on animals and say it can reliably detect both cholesterol and glucose in blood as well as some other common substances doctors look for. They hope to begin testing the device on intensive care patients - patients who require a great deal of close monitoring, including repeated blood tests. The research results will be published and presented at the Design, Automation, and Test in Europe (Date) electronics conference.